Dynamic balancing extends your equipment’s life by eliminating vibration that destroys mechanical components. We can balance rotors in their own bearings or on our fleet of portable balancing machines. 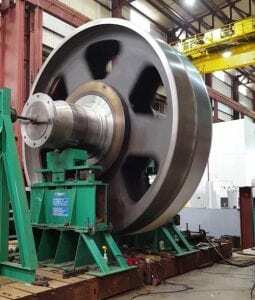 Our balancing machines are available for on-site balancing throughout the world for rotors weighing up to 400,000 lbs. Precision on-site balancing drastically reduces downtime and repair costs, while increasing your productivity. Our staff brings extensive balancing experience to your plant for virtually every type, shape, and size of rotor. We have balanced nuclear turbines, paper mill rolls, expanders, turbines, compressors, motors, gears, pumps and fans. High/Low Speed Dynamic On-Site balancing is provided by experienced VSC engineers and technicians for in-place balancing requirements. If the equipment can be operated at speed and there is access to the balance correction planes, VSC personnel perform single and multi-plane balancing on rigid and flexible rotors. Their skill and expertise, in combination with sophisticated instrumentation, assure you of a precision tolerance with a minimal amount of service time or machinery operation. The result is a precision balance and a quick return to service. During balancing, very close attention is paid to other conditions which may be adversely affecting operation of the machinery. 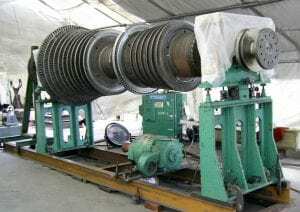 Any such conditions detected while rotor balancing are addressed and resolved at the appropriate time with respect to the balancing program. After balancing, rotor balance sensitivities are permanently recorded. This affords one shot trim balancing capability in any future balancing scenario. All service is followed up with a written report detailing findings, corrections, recommendations, etc. High/Low Speed Dynamic balancing is essential to maintaining healthy equipment. VSC’s precision and extensive balancing experience not only enriched Thomas Edison and Henry Ford’s inventions but was also paramount to US national security by keeping the US Navy’s silent submarine propellers silent. Our customers depend on us and can not endure mediocrity. VSC’s on-site/service center balancing capabilities are comprised of virtually every type of rotor from a couple grams to over 200 tons. We demand the most stringent precision with tolerances to within 0.0007 ounce-inches. There is only one company with nearly a century of critical solutions for customers who can only settle for excellence. Our Balancing Center’s near 100 year history of premier precision balancing continues as we exceed the most stringent tolerances down to micro ounce-inches. Our experienced staff’s detailed understanding of rotor dynamics ensures every element’s balance deficiencies are satisfied. Whether it involves resolving a rotor critical or properly addressing the cross-effect, each issue is solved with painstaking precision. In our precision balance center, we can balance virtually all rotors weighing from 1 gram to 20,000 lbs using one of our nine Schenck Trebel balancing machines. Besides balancing, we can design and fabricate special adapters, tooling, and fixtures in order to balance or repair your machinery. We also provide sandblasting, cleaning, special rotor speed testing and other pre- or post-balancing services. Our Precision Low Speed Balancing services are available 24 hours a day, 365 days a year. If necessary we can perform Low speed, On-Site Balancing with one of our eight portable balancing machines.